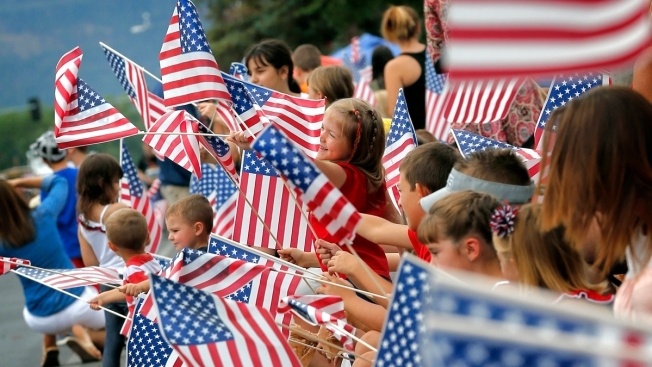 Presidential hopefuls are going on parade throughout the Granite State this July 4. At least seven 2016 candidates will spend Independence Day courting residents who will vote in the nation's first presidential primary contest next year, according to scheduled logged in necn's 2016 New Hampshire Primary Candidate Tracker, making a combined 14 stops. While parades are by far the most popular stops during the holiday tour — at least 11 such appearances are expected — candidates' Saturday calendars also include breakfasts, cookouts and grassroots events. Revelers along the routes in Amherst and Merrimack will watch no fewer than three candidates strut by. The resort town of Wolfeboro, where 2012 GOP nominee Mitt Romney owns a home, will be greeted by at least two GOP hopefuls. For some candidates, one parade just isn't enough. Republicans Jeb Bush, Lindsey Graham, and Rick Perry, as well as Democrat Lincoln Chafee, are marching in two apiece. Perry, the former Texas governor, appears to have the busiest public schedule on Saturday so far, stopping by parades in Amherst and Merrimack before greeting crowds at the Windham GOP July Fourth Cookout later in the day. The holiday hand-shaking isn't limited to July 4 itself. Christie, New Jersey's Republican governor, has been barnstorming the state since making his official entry into the race on Tuesday, including several events on Friday. Perry and Democrat Hillary Clinton are also getting their patriotic partying started early with Friday events, while former New York Gov. George Pataki and Louisiana Gov. Bobby Jindal, both candidates for the GOP nomination, will join New Hampshire residents wishing America a belated birthday with Sunday celebrations.